Sam Deguara slam dunks the ball against Ireland in Serravalle. The men's basketball national team picked up their second win in the FIBA Championship for Small States when they had the better of Ireland 76-65 in Serravalle on Wednesday. The match turned out to be a physical affair with Andrea Paccarie's men starting strongly and managed to end the opening quarter three-points ahead, 22-19. The Irish fought back strongly in the second quarter and managed to tie the score at half-time, 37-37. A spectacular dunk from Aaron Falzon handed Malta a five-point lead and that was a shot in the arm for the Maltese who inspired by Samuel Deguara, Kurt Kassar and Tevin Falzon they managed to extend their advantage to ten points. The Irish tried to reopen the match in the last session but the Maltese held on for a merited win. 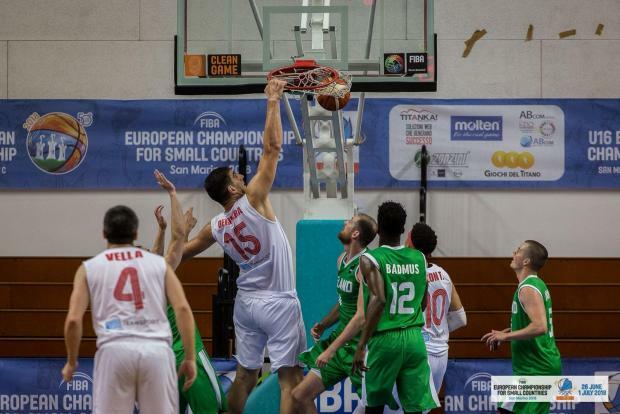 Aaron Falzon was Malta's leading scorer with 22 points, followed by Cassar, on 16, and Deguara 13. The win ensured that Maltese finished top of the group and are through to the semi-finals which will be played on Saturday.